Two stories plus bonus material in this issue. First, Scooby and the gang face “Mystery Mashing,” when Freddy wins tickets to the local monster truck rally. 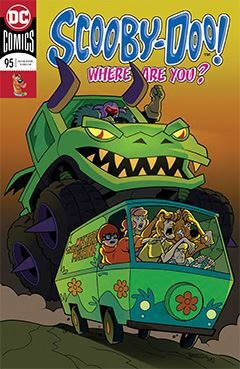 But when an actual monster truck invade the Coolsville Coliseum, they soup up the Mystery Machine in order to trap the culprit, and dig his way out of a four foot MUD PIT! (not really). Then the kids are off to college, where a mysterious virus seems t6o have infected a handful of students, turning them into zombie-like monsters. The story could easily dovetail into Scooby Apocalypse, but instead, it’s all a fraud, and the meddling kids get the better of, well, meddling kids. Jeralds’ artwork in the second story is a bit peculiar, with its heavy line work so inconsistent with the first story. Some pages look as if the panels have been enlarged, throwing contours all out of proportion. The stories are okay, though sometimes I wish they were longer, to sustain the narrative and allow for more suspects and distribution of clues. In the current format, no sooner is the scenario introduced than a solution is presented and it’s a matter of pulling off the culprit’s mask. It’s not as if there wasn’t room, as there are four additional pages. Two feature rebus puzzles with Aquaman, the other two feature minimal Who’s Who files on Batman and the Joker.